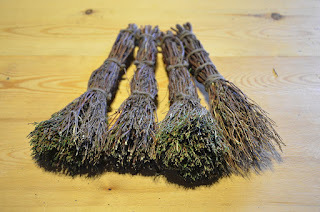 Ever on the lookout for alternatives to throwaway plastic landfill items, I recently learnt that in the crofts and country kitchens of old the pot scrubbing brushes were made from heather. It's an abundantly available resource, growing in profusion on the moors round about us and though I don't imagine I'll be thatching the roof with it or making rope from it, as folks used to do, I figured I could definitely make heather pot scourers. A web search turned up a museum photo of an old example, but nowhere could I find a write up on actually making one. Still, having seen what the finished product should look like, I was prepared to give it a go. Step one, obviously, was to go harvest some heather. 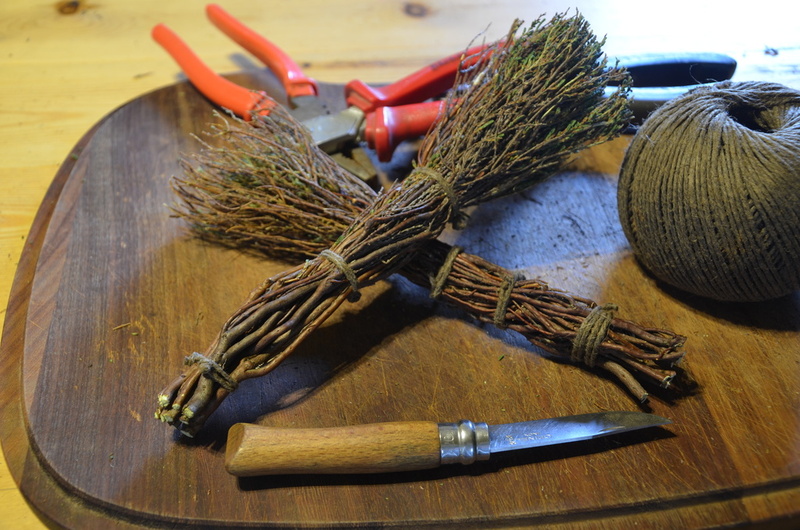 I selected reasonably straight branches, with a good spread of finer twigs at the top end, and cut lengths of approximately 8 inches. 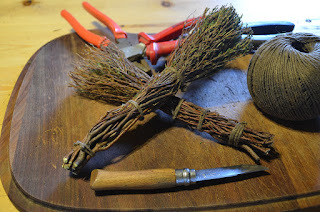 Next, I thrashed the collected bundle against a stone wall to dislodge the old flowers, leafy greens and any other loose material, before taking it all indoors to work on. 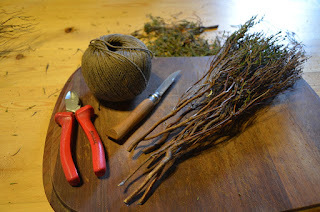 After trimming and shaping with a sharp knife, I collected the bundle together and bunched it into more or less its final form. 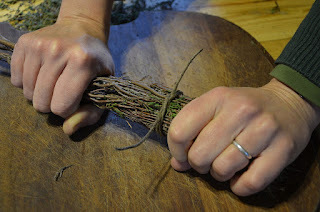 Here it's tremendously helpful to have a helper to hand, first to hold the bunch while you tie on the first knot of sturdy twine and then to tug on the other end of the knot to get it cinched in tight. The knot I would recommend is the constrictor. If no other good comes of this than more people learning the constrictor knot, my effort will be repaid. It's easy to tie and can be tightened as securely as a jubilee clip. See the tutorial for tying this super useful knot here. 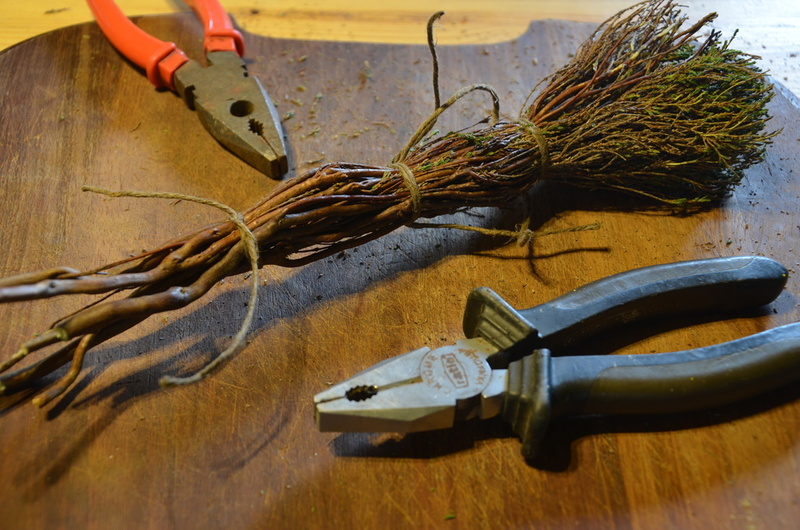 Have a pair of pliers each for yourself and your assistant to haul in tight on the ends. 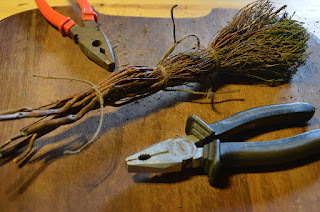 Once it's tight, finish each end with an overhand knot close in to the constrictor and trim off the excess. Add a second and a third band to the scrubber handle, trim the heather to the desired finish at either end and go do the washing-up! This scourer is also very useful for brushing up crumbs on the table.